It is the only interlocking floor tile on the planet with real aluminum diamond plate tread surface - easily snaps together&easily snaps apart. Unique laminate system combines the toughness and durability of a real aluminum tread surface with the versatility of an interlocking tile. Free floating design does not attach to the ground - XFloor lays on just about any surface with it's own weight. Use as an area floor with our border tiles (recommended) or go wall-to-wall by cutting tiles to size and shape. Perfect for shop, trailer, garage, store, tradeshow&more. Made with real commercial grade aluminum diamond plate found on the big rigs and NASCAR. Patent pending lamination process which permanently bonds together Real Commercial Grade Aluminum Diamond Plate with a Co-Polymer Base by using an exclusive aerospace grade flame lamination process at 385°F&30 tons of pressure. Need more inspiration? Check out how easy it is to arrange Diamond Plate metal flooring for a garage floor to be proud of! 12" x 12" x 1/2" Tiles fit any size or shape space. Perfect for shop, trailer, garage, store, tradeshow and more. 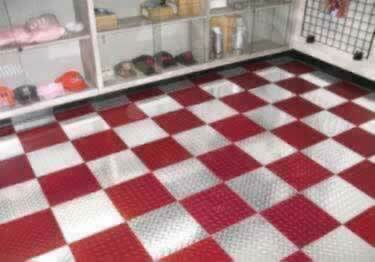 Will the diamond plate metal interlocking floor tiles work together with the plastic interlocking floor tiles? I have an additional 50 square feet to cover off the one car garage floor covered now with metal. No need to add metal if plastic will connect Ok to the existing metal there now and the black colors look similar as this area is just for standing in front of a work bench. Thanks, Danny O. How scratch resistant are the floor tiles? The guys can be like 5-year-olds when they have to move a desk or tool box. The sighing whining dragging, pushing with their weight on top of the item being moved. I need something industrial childish proof. Something that will not gouge easy. Just wondering why you there are no reviews on your web-site? How long you been in business? I may have missed it, but is there a warranty on the Diamond Plate Metal Interlocking Floor Tiles (#A464). Let me know. Thanks. Unique floor tile with laminate system combines the toughness and durability of a real aluminum tread surface with the versatility of an interlocking tile. Choice of professional sports teams, offers an anti-fatigue surface that provides exceptional traction & durability.